I’m sure many of the Android faithful out there have already jumped aboard the Instagram app for Android, much to the chagrin of of the iOS faithful for some reason who believe that Instagram should have been an iOS exclusive app, as we previously reported. 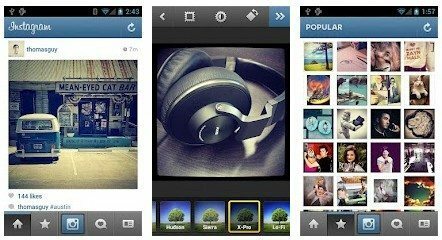 However, Instagram for Android is gaining popularity with the Android faithful. The Instagram for Android app has already received 166,819 5-star ratings with an average rating of 4.6, although 6,183 user rate the application as 1-star for one reason or another. With Instagram for Android the user has the ability to share photos via Facebook, Twitter, FourSquare, Tumblr and soon with Flickr, and has full front and rear camera support, with 100 percent free custom design borders and filters whilst Lux makes your images more vibrant bringing out the details, and is of course free from Google Play. The Android version of Instagram has been given a few reviews recently, with The Telegraph saying that plenty of other apps have tried to fill the space when Instagram wasn’t available on Android but failed to do so, and now Android users can meet the other 30 million Instagram users. Whilst PC Mag have also done an in-depth review of Instagram for Android and say that the app allows the user to put ‘folksy effects’ on dull images with a single tap and then share, although you can’t share images over text or email and you get a fragmented buggy experience on certain Android devices. We have a couple of video reviews of the Instagram app for Android for your viewing consideration below, the first via Androinica that lasts almost seven minutes, and the second from Androidtapp that lasts almost three and a half minutes so don’t forget to check them out. However, what we would really like to know is what our readers think of the Instagram Android app, we’d like your personal reviews of the app, which you can share in our comments area below, is the app working fine for you or are you experiencing issues, and what about now that Facebook has purchased Instagram, will you be deleting your account?